Hagerty Insurance asked its customers, mostly car collectors, to name the "Most questionable cars" of all time. These are the top vote-getters. Images of flaming Pintos are so seared into the public consciousness that it's probably hard for most people, unaided by a photograph, to conjure a mental image of the car while not on fire. Once the allegations became widely known, Ford's defensive public response tainted consumer perceptions of the Pinto and all Ford products of the time, according to Douglas Brinkley's biography of Ford Motor Co. "Wheels for the World." It was 1978 before Ford, faced with public hearings into the matter, finally recalled the Pintos it had built up to 1976. 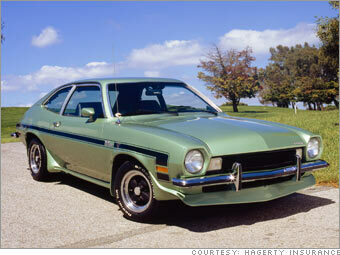 In one trial Ford Motor Co. was even held criminally liable for deaths in a Pinto fire. Ford won that case. In retrospect, it turns out that about as many people died in fiery crashes in Pintos as in other popular cars of that time, although crash tests indicated the gas tank problem was genuine.